Let's start with the OVA 17u girls where the Goldrush were in premiere in Burlington while the Eldorado were in Whitby at Championship. Early season challenges for the Goldrush under coach John Nguyen with injuries to some key positions but the Gold Rush were still in the running leading the quarter 13-8 in the third a win would have assured them a berth in Premier for the next OVA. Unfortunately we lost 13-15. Had a second chance to stay if we won the 5th/7th match came out strong and won the first set against LVC, was flat again for the second and the start of the third giving up 3-11 lead. An incredible display of serving by Marie-Sophie Hill-Huard got us back to 10-11 but our nemesis “the passing woes” came back and bit us. It’s now soul check time for the girls to see where/how their season will progress. While the Eldorado of coach Matt Monych were in a battle to remain in Championship in the 5/7 match-up and remain to keep their hoeps for premiere alive next time. Meanwhile at our traditional season kick off event the Omnium du Quebec in Sheerbrooke; no fewer than 9 teams filled 11 spots in the draw with both the Blackjacks and Wildcards playing in both Saturday and Sunday events. Saturday on the ladies side provided the biggest highlight of the weekend where coach Pat Henderson lead his Stampede to Gold at the 15u division. The girls put in a solid weekend controlling their matches early. In the final where I decided to slip in at a healthy 12-6 lead I found myself sacraficing my entertainment and leaving as coach Henderson called a time out at 16-15. Needdless to say my decision to leave was in the best interest of the team. I had thought early events in the day had shown that the Jynx was a thinkg of the past. 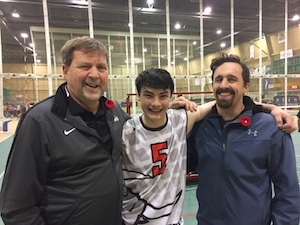 Meanwhile the Ambush chose to compete at the 16u level, something I am sure coach John Spack had decided would be in the best interests of the squad and their development. However, when the season plan was made no one told him he would be sitting beside three injured players all of whom are key pieces to the puzzle. Needless to say the rest of the team rose up to the challenge and competed well all day even in the quarterfinal where they fell to the Libelluelles in a well fought match. The Wildcards were in tough both days at 16u and 17u but coach Aaron Wade feels this type of solid competition and performance measuring stick was exactly what was needed to assess the team in top level games. At both 16u and 17u the Blackjacks showed their depth as they made the semi finals of both events made for Two long but very successful days for the squad. The girls were able to maximize their opportunities by being the last ones out of the gym both nights! Courageous performances by all players have set the identity of this team for the season. No medals to bring home, 4th twice, but the knowledge we took out the number 1 seed in 1/4's each day in epic three set matches. But the big take away is the girls became the 2017 16U BLACKJACK TEAM! 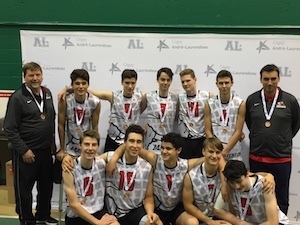 Meanwhile on the boys side my heart swelled with pride Saturday when I arrived to a couple of great comebacks, including the Bulls, of rookie head coach Tyler Legault, defeat of their cross town rivals and an eventual Bronze medal appearance at 16u. Both coach Rainville's Chargers and Ferland's Cavalry were able to not only able pull off wins and age group up but for the Chargers they were inches from being a second Maverick squad with a spot in the semis on some great serves by new comer Tehvan Blackmore. But the true moments of pride were watching the 14u Bandits lead by returning head coach Mike Spears compete two years above their age group and win several sets and an all important split in a two set match. With 3 of my former players on the bench coaching it was a sight for sore eyes after the drive into town for Sunday competition. Watching a healthy MIguel Dumetz return after season ending surgery last year gave me a sigh of relief as well. Sunday brought the first competition for my 16u Longhorns, also two years over their age category, but a little longer in the tooth and filled with experience; they set out to compete for first in their pool (losing to the Titans in a well played match) then battled into the Bronze medal match where they defeated the 18u Reds from Fredricton for a second straight time that day. Not a bad performance in a 6-3 system and upon losing their Team Ontario middle, JAcob Ferland, before a single point was played. This day also found me reunited with one of my favourite players of all time who was their with his cousin to enjoy the game once again.